Simon Says Stamp and Show: Simon Says Stamp and Show a Summer Holiday! Hello Everybody! Thank you for playing along with our last Challenge! The winners will be announced this Wednesday .... so don't forget to check back ... this could be your winning week! Before I set out the details for this week's challenge I have some sad news. After spending the best time on the Design Team with Ellen ... we have to say goodbye. Ellen is leaving us ...and we are all going to miss her ... so I am sad to say that this week will be the last time we will get to see her amazing creations here on the challenge blog. Of course you can still check out her wonderful art on her own blog. I am sure you will all join me, the Design Team and the entire Simon Says Stamp family by saying a huge THANK YOU to Ellen! The SUMMER HOLIDAY theme inspired Tracy to use the Huck Finn plate from Artistic Outpost as it reminds her of summer holidays by the seaside and exploring the the rock pools with her children. Lots of blending with Distress Ink broken china, faded jeans and brushed corduroy create the scenes on both her cards. With summer and lots of new memories on the way, Sarah decided to create a colourful panelled canvas cover for her new Art Journal. 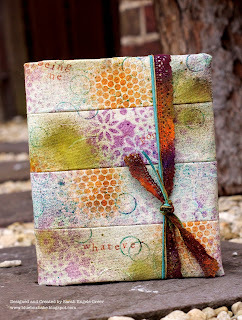 She used Ranger's Lettuce, Stream, Sunset Orange and Wild Plum Color Washes, Gesso and The Crafter's Workshop Flower Template, all finished off by stamping random words with Hero Arts peg stamps. The theme.....Summer Holiday conjurs up memories of her week at the beach....warm colors and beautiful flowers. She began with a tag which she colored with Twinkling H20's, Majestic Blue, Olive Vine and Teal Zircon. She used Jet Black Archival Ink and PaperArtsy stamp to finish off the background. And a good saying is ALWAYS the icing on any creation!! What better way to remember special SUMMER HOLIDAYS than through a vintage journal created entirely with Graphic 45's beautiful On The Boardwalk Paper Pad? A Tattered Floral made from Tim Holtz' Terminology Tissue Wrap and colorized with Distress Stains, a seashell and an anchor stamped from Paper Artsy's Hot Picks 1201 Stamp Set give some added dimension to this beautiful journal cover. When Terry thinks of the Summer Holidays she thinks of the Distress Stains Wild Honey and Broken China... great colours to create a Summer wall hanging. On the background she used Gesso, Distress stains and Distress Crackle Paints in Picket Fence, Antique Bronze and Crackle Rock Candy. 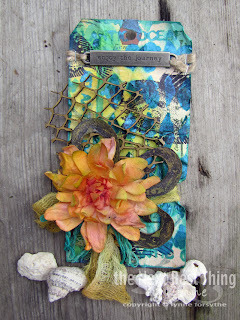 The paper and images are from the beautiful Graphic 45 On The Boardwalk Paper Pad. She added some seashells, a Rosette and Game Spinner to finish off her hanging. Ellen started with a marbled effect using distress stains to create a "pool" background. Then added the dressform / spool and butterfly stamps from Tim Holtz, watercolor scratch paper die cut with Tim's butterfly movers and shapers, over-stamped with the papillon background and vermillion archival ink, a philosophy tag, and finished it off with a hand-stamped sentiment using a mini alphabet stamp set, and a border with a white paint pen. 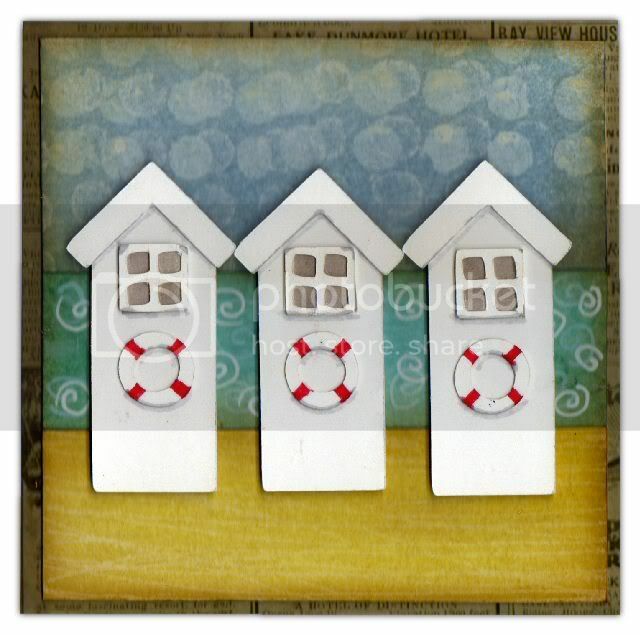 Dan was inspired by the beach huts you still sometimes see on English beaches, particularly in towns that were popular seaside resorts in Victorian times. 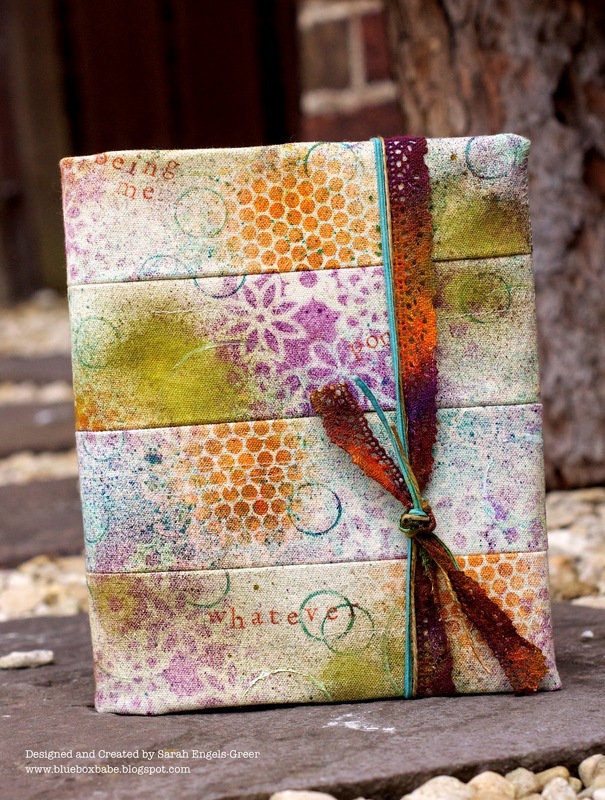 Products he used include the Mixed Media and Creative Textures stamp sets, Distress inks and markers, Promarkers and the Destinations paper stack. When I think back to Summer Holidays ... I think Daisy Chains and Sunshine ... I spent many a day sat in the grass making Daisy Chains. I used Paper Artsy Hot Pick 1203; Dylusions Pure Sunshine and Squeezed Orange Sprays to create my tag adding some text from Tim Holtz and a Gem Clip. The prize will go to a random entry chosen by Random Generator. The challenge will close at Midnight Eastern time on Sunday, 27th May 2012 and the winner will be announced during the following week. To qualify all you need to do is create a new piece of work ... post it on your blog ... with a link to this site and then pop a link below so everyone can come see what you made! These are all beautiful summer creations, I wish it was summer already, ;). Beautiful work from the DT again this week - we will miss Ellen for sure. I love the colors has chosen Sarah. I love the sunny side even though I have the sun all year. The all make me feel summer is here. Wonderful inspiration from the team and a great challenge! Sad to know that Ellen is leaving the team, but I know I'll continue to be inspired by her art on her blog! Beautifull creations from the DT!!! Love this challenge, because i love summertime!!! Brilliant challenge and fabulous creations by the dt! !